This classic brown leather notepad is the perfect portable office accessory for those who appreciate high quality products. Light and convenient it can slip easily into a briefcase allowing it to be taken to any meeting. Ideal for the organised executive who enjoys the class of genuine leather, it has 128 pages of high grade paper to promote a smooth writing experience. Complete with a debossed 1955 Pecten, it enhances any desk with its understated class. Combining heritage with innovation, this Moleskine notebook pairs Shell’s brand perfectly with Moleskine, a leader in supplying stationary to legendary greats such as Picasso and Van Gogh. This quality notepad quickly becomes an essential item of everyday life as it allows administrative tasks and recording to be done with style. Distinguished and exquisite, the addition of the subtle Pecten design takes this notepad to a whole new level. 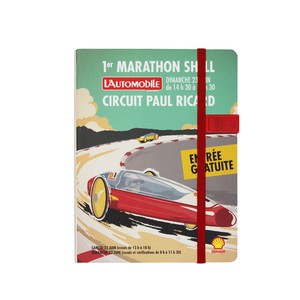 This simple moleskin notepad features a subtly embossed Shell Pecten and Kia Logo. The embossed moleskin notepad exudes elegance as it uses the favourite material of executive stationary as a perfect finish. The quality is immediately evident yet it doesn’t compromise on practicality. The blank leaves allow owners to take notes without the restrictions of lines while the band secures all pages together so it doesn’t tear in the pocket. Note it or Store it! Accentuating Shell’s commitment to innovation and technology, this accommodating A5 notebook combines the traditional features with the 21st century alternative. Invisible to the naked eye, the 8GB USB flashdrive blends seamlessly into the notebook cover providing a convenient memory stick on the move. The band ensures that a place is never lost, while the high quality finish keeps the pages fresh and perfectly formed for longer. An A5 fully digitally printed notepad. A 4GB USB is neatly incorporated in the cover for storage on the go, whilst the strap allows for loose notes or cards to be kept in place.